Your home is where you live and spend most of your time. Unfortunately many homes are very uncomfortable and homeowners have just accepted the discomfort. This is an unnecessary shame. Quality 1st Basements properly insulates your home's foundation improving home comfort and lowering energy costs. Our insulation is designed to withstand water and moisture in the basement and last for the lifetime of your home. This means you don't have to deal with chilly floors, a cold or moist basement, a damp, wet crawlspace or expensive heating bills. Give us a call today 1-844-237-3440 or click the button below to get started. The best crawl space insulation. We install SilverGlo® rigid foam insulation against crawl space walls and TerraBlock™ flexible foam insulation on the crawl space floor, beneath the moisture barrier. This provides the extra comfort and energy savings you need. 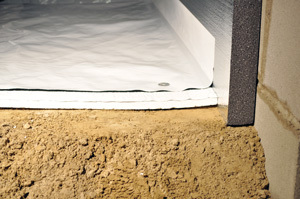 Crawl Space Encapsulation protects the crawl space from moisture, mold and rot. However, it does not prevent outside air from entering the space or heat loss through the walls and floors. To do that you need the right kind of crawl space insulation. Fiberglass batts are not the right type of insulation. Batts absorb moisture, compress and fall off which means they quickly lose any insulating quality. The proper way to insulate your basement is by installing SilverGlo® rigid foam insulation against crawl space walls and TerraBlock™ foam insulation over the floor. Both types of insulation have a high R-value preventing heat transfer. They also don't fall, absorb moisture, support mold or deteriorate. Basically, they are everything fiberglass batts are not. If you want to keep your home warm in the winter and cool in the summer proper crawl space insultion is a good place to start. 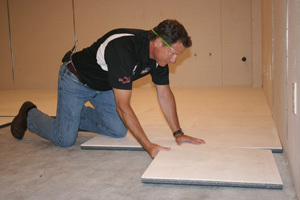 [company[ is New York City's and Staten Island's trusted crawl space insulation contractor. Wiring channels have been incorporated into each panel to make it easy to install wall outlets, switches and lights. 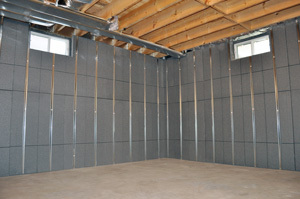 We insulate the basements of your New York City neighbors including in Staten Island. We can help you start from the ground up to improve your home. By creating a dry, comfortable space below your home, you can improve the condition of your living space above. We provide waterproofing and insulation services to customers in New York City, Brooklyn, Bronx, Staten Island & nearby.